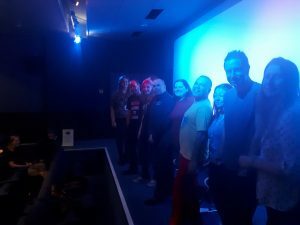 On 1st December 2018, the Come As You Are (CAYA) Arts Festival at Poole Lighthouse (the final stage of this brilliant national festival tour) — https://www.lighthousepoole.co.uk/whats-on/2018/come-as-you-are-festival/ — concluded, with the day’s programme including a Panel Discussion on issues covered by the festival performances in regard to NHS engagement with our Trans & Non-Binary community, in the services they provide, and how these are provided.The Chief Executive Officers of two Dorset area NHS organisations (Dorset CCG and Dorset Healthcare) were invited to attend, but unfortunately couldn’t due to prior commitments — they (and we appreciate this) sent their good wishes: however both organisations, though asked to send appropriate level senior officers to directly represent the two CEOs if they themselves couldn’t attend, chose to overlook this request. For reference the Network and our main LGBT community partner organisations are very aware of multiple continuing cases of unchallenged transphobic, homophobic, biphobic views [causing major distress to consequently intimidated LGBT community members who are NHS staff or NHS services users] across Dorset area NHS organisations. Alan Mercel-Sanca (Initiator/lead founder, and Convenor/Lead Officer of the LGB&T Dorset Equality Network, and male Co-Chair of Just a Ball Game? Anti-LGBT prejudice in football and sport national grassroots organisation) facilitated and chaired the panel discussion. Perceptions were strong in the discussions that the NHS at local and national levels is still struggling, some 8 to 9 years on from the passing of the Equality Act, with applying its spirit and legal provisions on Trans & Non-Binary inclusion and effective combatting of in particular indirect discrimination, where healthcare services are concerned in their scope and provision. The community wants to work with the NHS on this directly to help, which means a new form of partnering and community engagement, and on a mutually assistive and mutually respecting basis where transparency is key. Mental health issues and distress caused by rejection, transphobia, and still substantial NHS healthcare professionals’ non-comprehension of how to listen to and engage with Trans & Non-Binary communities and their members on medical, health, and wellbeing issues and needs; change/improvement is needed in this sense to in many cases safe lives and prevent lives being put in jeopardy. Trans and Non-Binary communities supportive medical, healthcare, and wellbeing services in the NHS are seen as still too little joined up, and with abrupt disconnection often after the journey of medical transitioning is complete. NHS Trans & Non-Binary community members/NHS service users’ communication & engagement training: this is seen as largely ineffective, and the community expresses interest in the criteria NHS organisations use for who and what is commissioned on training. Trans community members and key figures offer their insights and guidance to the NHS to help it improve its performance where meaningful as opposed to ineffective E&D training is concerned. Community monitoring of performance of NHS frontline organisations and commissioning, emerged as a ‘must’ for effective improvement and change – particularly as it would lead to a change in culture at middle to upper levels of the NHS, especially within admin/bureaucratic echelons far removed from direct medical or frontline services provision. That there are still too many examples locally of bad practice on communication, particularly in regard to mis-gendering (mostly but not always, unintended), and yet, as detailed in the panel discussion, there are some true best practice examples on communication and engagement that community members are aware of and experiencing. This gives confidence that with community solidarity and focus, and good strategy for effective engagement with those responsible for commissioning and implementing NHS services, best practice can be spread, and bad practice highlighted, engaged with, and overcome. For this to take place, it is essential that those in lead and key decision-making positions in key NHS commissioning and service delivering organisations need to ensure that perceived [by the community] tick-box approaches are replaced by the same degree of seriousness that they have in many other directions, and especially so as they have had ample first hand and research [national and local] indicating the issues, the needs and the solutions. This of course does matter when we consider the issues around mental health, and the scale of suicide risk for many Trans community members who are not supported as they need and deserve. These will be for the Network and its partners, to hold a follow up discussion event, which will include broader LGBT, NHS and social care engagement topics with a report and recommendations to follow addressed to local and national (including parliament) – this assisting new and further engagement with the local NHS organisations in the areas and ways suggested at the Lighthouse discussion panel (training, monitoring, best practice dissemination, etc.). The Women & Equalities Select Committee inquiry report gives a badly needed boost and catalyst for change/improvement. The Network’s role in contributing to this substantially, as kindly praised by the secretariat of the committee, certainly assists to also engage effectively with local (and perhaps regionally & nationally) NHS organisations, as the Report recommendations are increasingly considered at implementation level.